c. 950 â€“ 1020 AD Abhinavagupta was one of Indiaâ€™s greatest philosophers, mystics and aestheticians. He was also considered an important musician, poet, dramatist, exegete, theologian, and logician â€” a polymathic personality who exercised strong influences on Indian culture. 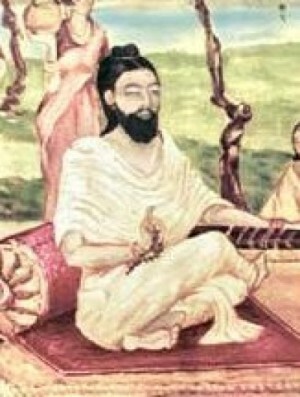 ABHINAVAGUPTA lived in Kashmir about the end of the tenth and beginning of eleventh centuries A.D. A versatile genius he injected new meaning into Shaiva Philosophy. As an original thinker he shattered to pieces the established belief which laid heavy emphasis on caste and gender restrictions in relation to spiritual practice. He took to task those philosophical systems which held the prerequisite that spirituality required rigorous disciplineâ€“systems which made the quest for enlightenment the legitimate right of a chosen few. He abhorred the idea that spiritual revelation was only possible in a purely monastic surrounding, or that those caught in the householder way of life had to wait till the last portion of life before they could fully give themselves to spiritual pursuits. This idea was best expressed by Abhinavagupta in one of his concluding verses of Patanjaliâ€™s Paramarthasara: â€œO my devotees! On this path of supreme Bhairava, whoever has taken a step with pure desire, no matter if that desire is slow or intense; it does not matter if he is a Brahmin, if he is a sweeper, if he is an outcast, or if he is anybody; he becomes one with Para-bhairava.â€ Abhinavaguptaâ€™s ideas were radical for his time, but since he spoke from the level of direct experience no one was capable of refuting him. Having achieved the eight great siddhi powers he clearly exhibited the six illustrious spiritual signs: unswerving devotional attachment to Shiva; full attainment of mantra siddhi; control over the five elements; capacity to accomplish any desired end; complete mastery over the science of rhetoric and poetry; and the spontaneous dawning of knowledge of all philosophies. The poet Madhuraja asserted that Abhinavagupta was the incarnation of Bhairava-natha Shiva. Swami Lakshmanjoo considered Abhinavagupta the pride of Kashmir and the final authority on all aspects of Shaivism. Even today his works and teachings continue to deeply influence discerning people worldwide. Quotes This bliss is not like the intoxication of wine or that of riches, nor similar to union with the beloved. The manifestation of the light of consciousness is not like the ray of light from a lamp, sun or moon. When one frees oneself from accumulated multiplicity, the state of bliss is like that of putting down a burden; the manifestation of the Light is like the acquiring of a lost treasure, the domain of universal non-duality. Nothing perceived is independent of perception and perception differs not from the perceiver, therefore the universe is nothing but the perceiver. Philosophy is an elaboration of different kinds of experiences. The abstractions of high-grade metaphysics are based on spiritual experience and derive their whole value from the experiences they symbolize. Relative distinction between two realities is not impossible. This is the doctrine of Supreme Unity in which in which relative distinction is neither shunned nor accepted. While there is an external difference between phenomena, there is none inwardly. The existence or non-existence of phenomena within the domain of the empirical cannot be established unless they rest within consciousness. In fact, phenomena which rest within consciousness are apparent. And the fact of their appearing is itself their oneness with consciousness because consciousness is nothing but the fact of appearing. The group of subjects, the various means of knowledge, the multiple kinds of knowledge and the objects of knowledge â€“ all this is consciousness alone. The Supreme Goddess is the absolute freedom of consciousness which assumes all these forms. Both characteristics, unity and diversity, are found in that which does not fall to the level of an object but which, because it is consciousness, is the supremely real Light. It has only one characteristic, namely, consciousness which is the perfect medium of reflection. This is what experience tells us. The truth is therefore this: the Supreme Lord manifests freely all the varied play of emissions and absorptions in the sky of his own nature. The Light is the supreme reality that encompasses all the categories from Earth to Paramasiva, while the unfolding of the reflective awareness of the Heart of I consciousness within it, distinguishes between them. Absolute consciousness is manifest here in every circumstance of daily life because it is everywhere full and perfect. Consciousness is said to be the cause of all things because it is everywhere emergent as each manifest entity. The extremely pure conscious reality transcends all talk of succession and its absence. Immersing himself in the supreme reality, clearly aware that consciousness is all things, the yogiâ€™s consciousness vibrates. This vibration is the Great Pervasion. The yogi should abide firmly fixed in his own nature by the power of the exertion of his expanding consciousness. Thus he is established on the plane of Bliss relishing the objects of sense that spontaneously appear before him. Perfected yogis (siddha) , are ever steadfast in this, the Supreme Gesture (mudra), the perfect and unobstructed expansion of the awakened. The couple (yamala) is consciousness itself; the unifying emission and the stable abode. It is the absolute, the noble cosmic bliss consisting of both (Siva and Sakti). It is the supreme secret of Kula (the ultimate reality); neither quiescent or emergent, it is the flowing fount of both quiescence and emergence. The variety of this world can only be manifested if the Highest Lord, Who is essentially the pure light of consciousness, exists; just as a surface is necessary for a picture. Other achievements are in vain if one has missed the supreme reality, the Self. But once one has attained this reality there is nothing left that one could desire. Oneness is like the clear blue sky- everything arises, unfolds, and subsides within its all-compassionate loveâ€¦. Everything is an aspect of Oneness. And our quest to know this comes from Oneness.